More than 8 million pounds of bisphenol A (BPA), a common chemical used in manufacturing plastics, is produced each year for consumer goods and medical products. This endocrine disruptor reaches 90 percent of the population, and excessive exposure to BPA, e.g., plastic bottles, cash register receipts, and even deodorant, is associated with adverse cardiovascular events that range from heart arrhythmias and angina to atherosclerosis, the leading cause of death in the U.S.
To examine the impact BPA could have in children, researchers with Children’s National Heart Institute and the Sheikh Zayed Institute for Pediatric Surgical Innovation evaluated the short-term risks of BPA exposure in a preclinical setting. This experimental research finds developing heart cells respond to short-term BPA exposure with slowed heart rates, irregular heart rhythms and calcium instabilities. While more research is needed to provide clinical recommendations, this preclinical model paves the way for future study designs to see if young patients exposed to BPA from medical devices or surgical procedures have adverse cardiac events and altered cardiac function. The significance of this research is that plastics have revolutionized the way clinicians and surgeons treat young patients, especially patients with compromised immune or cardiac function. Implications of Dr. Posnack’s future research may incentivize the development of alternative products used by medical device manufacturers and encourage the research community to study the impact of plastics on sensitive patient populations. This research, which appears as an online advance in Nature’s Scientific Reports, was supported by the National Institutes of Health under awards R00ES023477, RO1HL139472 and UL1TR000075, Children’s Research Institute and the Children’s National Heart Institute. NVIDIA Corporation provided GPUs, computational devices, for this study. Could yoga, meditation, group support, or online video chats improve outcomes for adolescents with cardiac diagnoses? 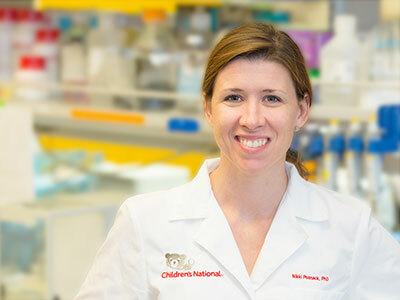 Vicki Freedenberg, Ph.D., R.N., electrophysiology nurse scientist at Children’s National Health System, shared insights from her research using these interventions at the American Heart Association (AHA) Scientific Sessions, held November 12-16 in New Orleans. The AHA Scientific Sessions featured the latest developments in science and cardiovascular clinical practice, including all aspects of basic, clinical, population, and translational science. In her presentation titled “Mindfulness Based Stress Reduction and Group Support Decrease Stress, Anxiety, and Depression in Adolescents with Cardiac Diagnoses: A Randomized Two-Group Study,” Freedenberg presented findings from her study comparing outcomes between cardiac patients who participated in a Mindfulness Based Stress Reduction program, which used meditation, yoga, and group support, and a second group that participated in a clinician-led online video support group with peers. Early results suggest that stress significantly decreased in both groups, and higher baseline anxiety and depression scores predicted lower levels of post-intervention anxiety and depression. 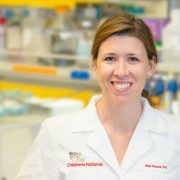 Read more about Children’s National AHA Scientific Sessions speakers. Over the 22 years that Mary T. Donofrio, M.D., has been practicing fetal cardiology, the field has changed radically. The goal once had been simply to offer parents an accurate diagnosis and prepare them for sometimes devastating outcomes. Now, Dr. Donofrio, who directs the Fetal Heart Program and Critical Care Delivery Program at Children’s National Health System, says specialists can follow fetuses throughout the pregnancy and manage many conditions in the womb, greatly improving their chances of living long and productive lives. Case in point: Transposition of the great arteries, a congenital defect characterized by reversal of the heart’s two main arteries—the aorta, which distributes oxygenated blood throughout the body, and the pulmonary artery, which carries deoxygenated blood from the heart to the lungs. The single abnormality means that the oxygenated “red” blood flows back to the lungs while deoxygenated “blue” blood flows out to the body. After birth, when the cord is clamped and the connection to the placenta severed, the baby’s cardiovascular system must adjust. If the fetal connections between the two sides of the heart no longer remain, the brain and other organs in infants with this defect are severely deprived of oxygen. The condition may be fatal if something is not done immediately to reopen the fetal connections to stabilize the circulation before surgery can be done. But if the fetal cardiologist can keep tabs on what’s happening to the heart over time and prepare a specialty team of cardiologists to treat the problem immediately after birth, chances of survival are significantly improved. 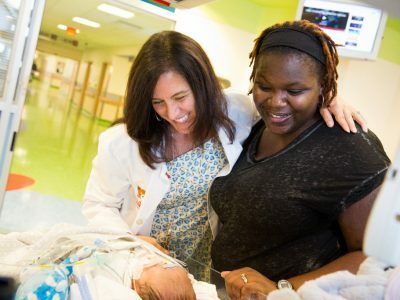 In a paper published recently in the Journal of Neonatal-Perinatal Medicine, she and colleagues illustrate the dramatic transformation in care that has taken place in the 14 years since this unforgettable case. The new publication describes the case of a different fetus diagnosed at 22 weeks gestation with transposition of the great arteries in 2015 at Children’s National. Unlike many congenital heart disorders, the heart’s four chambers appear misleadingly normal at the typical mid-pregnancy ultrasound. Despite the challenging diagnosis for many obstetricians, this fetus’ heart condition was recognized early by looking at the arteries leaving the heart in addition to the chambers. While such a defect is fatal if left untreated, Dr. Donofrio explains there are two pathways that can allow the blood to get to where it needs to go such that the circulation is stabilized and the damage mitigated. One is the fetal blood vessel known as the ductus arteriosus that typically stays open for a day or two after birth. The second is an opening between the heart’s two upper chambers, known as the foramen ovale, which usually closes upon delivery. By keeping those two pathways open, blood can cross from one side of the heart to the other, buying time in the delivery room so that babies can be stabilized before they receive surgery to permanently move the arteries back to their normal position. In the 2015 case, Dr. Donofrio and colleagues had the chance to monitor the fetus and the fetal heart at follow-up appointments every four weeks after diagnosis. What they saw completely changed the course of their treatment plan and likely saved the baby’s life. With each ultrasound, they saw that the ductus arteriosus and the foramen ovale—the critical connections needed for survival—were gradually closing. Dr. Donofrio noted at the fetal evaluation at 38 weeks that the structures had closed, and the heart was showing signs that it was not functioning well. 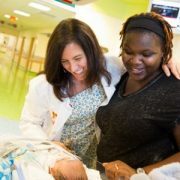 She and her team realized that the only way to save this baby was to deliver earlier than planned and to have cardiac specialists standing by ready to perform a life-saving procedure to open the connections right after the baby was separated from the placenta. The baby was delivered by Cesarean section in the cardiac operating room at Children’s. The cardiac intervention team immediately created a hole where the foramen ovale should have been by using a balloon to open the tissue that had closed. The care team also administered a prostaglandin infusion, a drug that can keep the ductus arteriosis open. This time, however, the medicine did not work. The baby was stabilized with several cardiac medications and, with little time to spare, the cardiac surgeons operated on the one-day-old baby to switch his great arteries back to the normal position, saving his life. The baby is now 1-year-old, Dr. Donofrio says, and is healthy—a scenario that likely wouldn’t have happened had the fetal team not made the diagnosis and continually monitored the condition in the womb.